I canceled my cable television subscription in early 2008. But, like most so-called cordcutters, I didn’t actually cut any cords. I retained what was then 5 megabit/second internet service over the same cable that had been providing television programs. Over time, more folks have embraced “cordcutting”, by which they usually mean dropping cable television for online streaming services over the internet. Kim Komando released a chart of popular channels and which streaming services offer them. Back in 2008, that was a more dramatic choice to make than it is over a decade later. YouTube was around, but didn’t offer high-definition video, and Netflix was only one year into its streaming service with limited title selections and monthly rentals. Back then I got the movies I wanted on disc from Netflix, and the few television episodes I wanted to see were purchased and downloaded in advance with my first-generation Apple TV or Amazon’s Unbox service to a Tivo. That was better than trying to stream them, because the limited bandwidth led to much buffering suffering. A decade later, Meador Manor has 40 times more download bandwidth, so Wendy and I can simultaneously watch multiple 4K video streams without noticeably affecting other internet operations. We can rent movies from iTunes, Amazon, or Google Play to watch together on the 55″ television using its built-in apps, our Chromecast Ultra, or our Apple TV 4K. The Chromecast Ultra works with our Google Home so we can just tell Google to turn on the television and cue up a YouTube video of our choosing. But we consume most of our video entertainment separately on our own iPads, and the only streaming video subscription I have (outside of on-demand movie rentals) is that YouTube Premium is bundled with my $10/month Google Play Music service. The premium service used to be called YouTube Red and removes ads while offering background and offline video playback. YouTube has evolved to where it has a plethora of high-quality content on most topics. 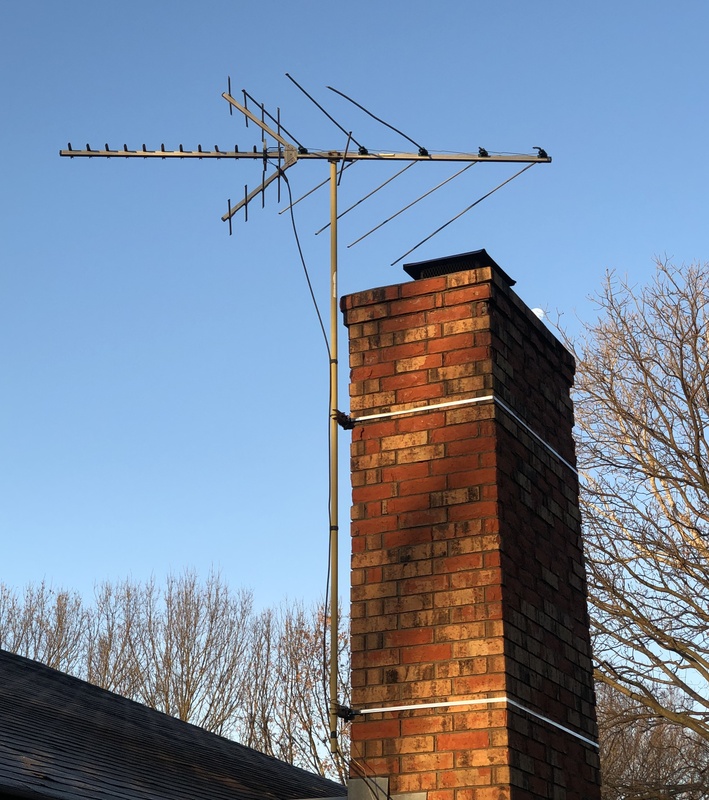 There are still some local and national television shows that can be entertaining, and the antenna I mounted on the chimney back in 1995 can still pull in up to 31 free broadcast television channels even though hail, ice, and wind have stripped it of a couple of its VHF elements. In the spirit of the wonderful Chaos Manor columns the late great Jerry Pournelle once wrote in the long-defunct Byte magazine, I’ll share the details of my travails in getting everything set up and how that led me to finally purchase a streaming service subscription which brought what I still think of as cable TV channels back to Meador Manor. I started out only intending to get the free over-the-air television broadcasts onto our various devices. A little internet research led me to purchase a HD HomeRun Connect Duo box for $70. Since we could always cast from our devices to the Apple TV, rather than split the antenna signal between the television and the HomeRun’s two tuners, I just disconnected the antenna’s coaxial cable from the back of the television and screwed it on the connector on the HomeRun box. I needed to wire the HomeRun into our network router with the bundled ethernet cable, but found that every port on the router as well as a 5-port switch hooked into it were full. I’ve cooked up a spaghetti of cords in the area behind my television, but the recent installation of new carpet did lead me to organize and label the mess. Plugged into the router back there are cables for my desktop computer in the office, the television, the sound amplifier, a Blu-Ray player, a Philips Hue hub, an Apple TV, and a Chromecast. So I purchased an 8-port switch for $30 and swapped that for the 5-port one, plugged in the HomeRun box, and mixed its power cord in with the others. The box powered on, ready to be configured. I’ve become accustomed to configuring new smart home devices using my iPad or iPhone via WiFi. So I tried loading the configuration website on the iPad, but no new devices were detected. Guessing that the hardwired device might for some reason need to talk to another hardwired device plugged into the router, I went to my Windows desktop, but again nothing showed up. Huh? A check of the living room network connections revealed what happened. When I swapped switches, I just unplugged the ethernet cable from the router to the old switch and plugged it into the new one, as I did with the other cables hooked into the old switch. In messing about I had inadvertently jostled loose the other end of the cable connecting the switch into the router, and now it had buried itself amongst the other cables. I fished it out and made sure it was snapped into the router. I trotted back to the Windows computer in my office to check things out, since it is often easier to configure devices with a big screen and keyboard than on an iPad, especially if you have to create or use any logins. Sure enough, refreshing the HomeRun configuration webpage showed the device was now in the network, although it was whining about a firmware update to be installed. After that was completed, which took a few minutes, I clicked on Channel Lineup and, just like a television’s usual tuner setup, it scanned through the available digital channels and displayed what it found. But, alas, it only found 15 channels instead of the usual 31. The various HDTV and standard-definition sub-channels for the NBC, ABC, and OETA affiliates were missing entirely. I did a web search for help, finding suggestions about adjusting the gain on any signal booster on the antenna. So back to the living room I went, to reach behind my recliner for the old antenna signal booster I bought back in 1995. It has been faithfully heating the carpet back there for almost a quarter-century, as well as making it possible to tune in the weaker signals from some transmitter antennas which are over 50 miles away. Given the distance to the transmitters, I did not believe the signal was so strong it was overwhelming the HomeRun’s tuners. But I dialed down the gain adjust and went back to rescan channels. Sure enough, that only led to even fewer of them showing up. Trying the gain in the middle made no difference, and at full power I was back to only 15 out of 31 channels. Harumph! Another web search revealed that if I installed the Windows software for the HomeRun unit, there was a utility program included which I could use to see the signal quality on the various channels. Doing that merely confirmed that it couldn’t get a readable signal for the missing affiliates. I figured there must be some problem with my home’s antenna system, so I went back and pondered the signal booster. Some fairly distant channels were coming through, so I doubted the exterior antenna connections were faulty. Then I noticed the FM trap switch was set to IN. That helps reduce any interference from nearby FM transmitters, but perhaps it was causing issues. I set it to OUT and, sure enough, a rescan showed the HomeRun’s two tuners were now finding all 31 channels. Yippee! 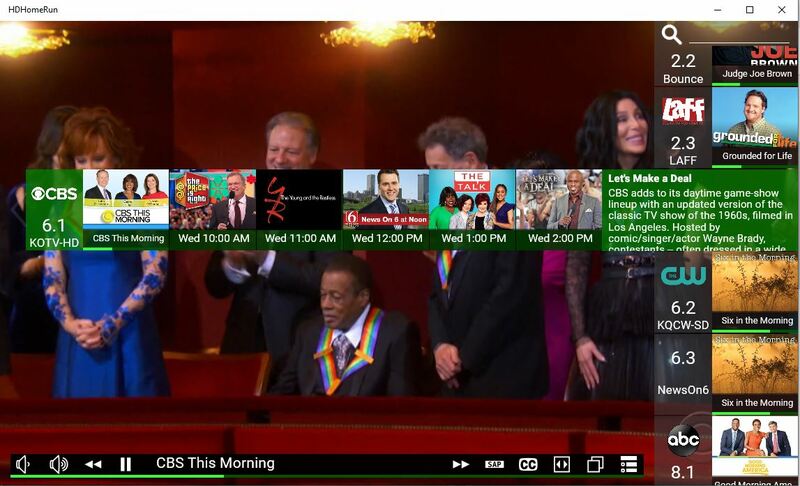 I installed the HD HomeRun Windows 10 app on my desktop and was able to quickly tune in any of the channels. Downloading and installing the app on my iPad was a breeze and worked fine too. Even better, I did not need to set up any sort of account with SiliconDust, the makers of the HomeRun unit. The apps just work when a device is connected to my router’s wired or wireless network. Tapping the screen brings up various controls, including a scrolling sidebar with what’s showing on each channel. I eventually discovered you can tap the right edge of the previews to get descriptions and thumbnails of upcoming shows. You can also tap a menu icon for thumbnails of what’s currently showing as well as upcoming shows and movies in the next 24 hours. However, the HD HomeRun has no traditional grid viewing guide and does not let you edit which channels it displays. In practice, my damaged old antenna cannot pull in channels 2 (NBC) and 8 (ABC) if signal is degraded by rain. It also struggles with 44, but that’s an Okmulgee channel that mainly shows shopping channels I could not care less about. The high-definition channels look great on my iPad and desktop computer, although since they are 16:9, they display on the iPad with black bars at the top and bottom. The standard-definition ones are quite grainy or fuzzy due to their low resolution, and 4:3 broadcasts display with black bars on the left and right. A few broadcasts sent out in a 4:3 anamorphic mode should be displayed stretched back into a 16:9 ratio, but the app doesn’t always pick up on that, resulting in a squished image. Sometimes a 4:3 broadcast is displayed in 16:9 mode, with black bars on all sides, but there is a zoom button to make it fill the screen properly. SiliconDust offers premium channels for $35/month, which is similar to what one would pay for Hulu, Sling TV, and other similar streaming services. I used two different TiVo digital video recorders over the years, enjoying the ability to pre-record shows and later view them while skipping commercials. I gave one to my parents, and they loved it. When their unit finally died, I gave them my Series 3 TiVo, since it has a lifetime TiVo service subscription. They still use it daily, whereas it had gathered dust for months in my home. The continuing value of a DVR was reinforced when I watched a show via the HD HomeRun on my iPad. I haven’t had to sit through television commercials in years, other than the ones in the aerobics shows I taped from 1993-1997 and habitually ignore in my weekday workouts. They haven’t become any less intrusive or annoying, so I knew I’d want a DVR so I could not only pause shows, but also fast-forward through commercials and time-shift programs to fit my schedule. You can subscribe to a DVR app from SiliconDust to use your desktop computer or network attached storage to create and playback recordings, but one reason I went with their HD HomeRun box was that it is compatible with the Plex Media Server software I already run on my Windows 10 desktop. 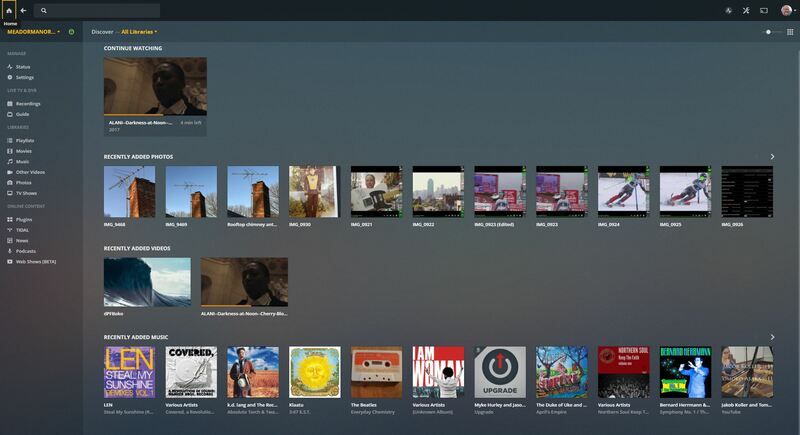 I had downloaded the Plex software to my Windows desktop years back since it is a way to share your saved music, photos, and other media files via the Plex app running on a web browser or various devices, including my Apple TV, iPad, iPhone, and Chromecast. 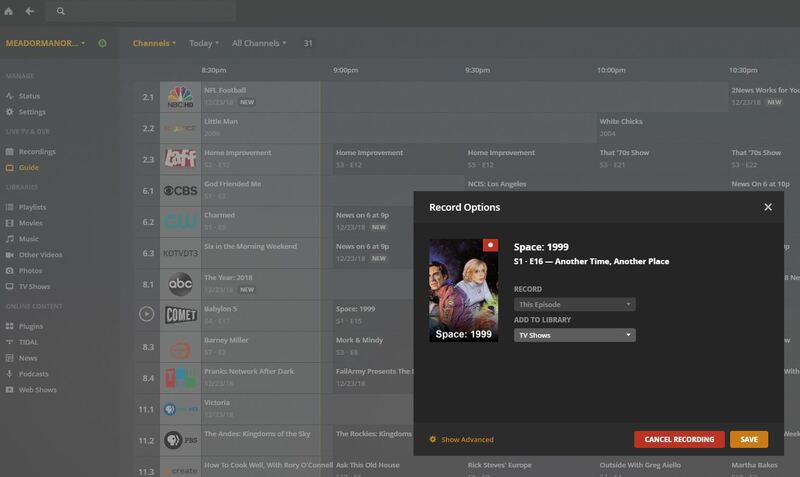 I hadn’t really ever used it, however, even though a year ago I had also purchased a lifetime Plex Pass to allow me to turn my desktop computer into a DVR and get programming guides without paying any subscription fees. 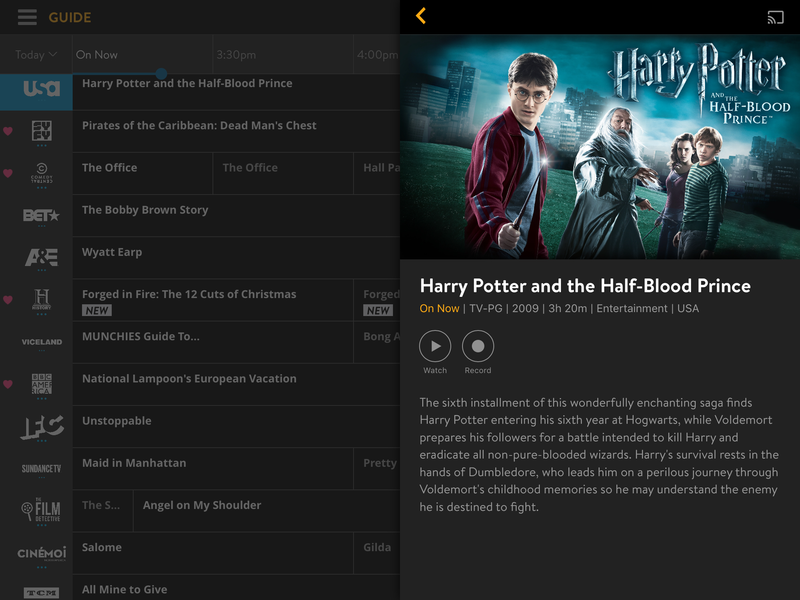 At the time, I wasn’t sure where I was headed with the home entertainment system and our personal devices, but the lifetime TiVo subscription I’d purchased years back had worked out great for both me and my parents, so I decided to risk investing in a lifetime Plex subscription to be future-ready. Now it was time to try out that investment. I opened up the configuration settings for the Plex Media Server software on my Windows 10 desktop, finding the DVR category. But when I triggered it, it briefly showed it had detected the HD HomeRun Connect unit, but then blanked that out. Another glitch to resolve. Earlier, I’d noticed when I ran the HomeRun diagnostic utility that it complained that some Universal Plug and Play (UPnP) data packets were not making it through the server, warning that would affect some services. I figured that was the problem with the Plex software, and another web search told me to go enable UPnP packets on my router. So I opened up my Asus router’s configuration controls, found the Enable UPnP setting in its WAN menu, and that did the trick: the HD HomeRun Connect Duo appeared in the Plex server’s DVR section. The Plex software allowed me to choose which channels to link with my DVR; I just picked them all. I was able to have it download a grid viewing guide, and clicked on an entry in that guide to record a show. That in turn prompted me to set up libraries in the Plex software for TV shows and movies. A perusal of the built-in help system told me where to click to do that, selecting folders on my desktop computer where my videos would be stored for retrieval. I also enabled some User Agent options that use any meta-data in the video files to organize the items. I then clicked on an upcoming show to have it recorded. It asked if I wanted to record only that episode or all that were aired, and gave me an option of which library to use for the recordings. Advanced options included adjusting the start and stop times if you find you need some leeway at the front or back end of a show. There was also an option for it to try to automatically remove commercials, with a caveat that it could result in high CPU usage. My desktop is pretty powerful, so I turned that on to see how that went. However, none of those options would do any good if my computer went to sleep and didn’t wake up when a show needs to be recorded. I checked that “Wake Timers” were enabled in my Windows 10 desktop’s power management and then put the system to sleep. I was pleased to note that even when “sleeping” the sophisticated Plex software could work with Windows 10 and still allow me to stream music and video from my desktop to my other devices. Even better, although the show I had set to record did not show up in my recordings library while it was occurring, the next morning I did find it had recorded successfully. I could play the recording on my desktop, and when I paused it and opened the Plex app on my iPad, it could resume playback where I had left off. The software did NOT successfully remove any commercials from the CBS show I randomly picked to record, and that hour-long recording consumed 6.3 GB of space on my desktop’s solid state drive. I have over 500 GB free on that drive, so it could store plenty of recordings, although I have no interest in archiving videos on my local storage; unlike with music, I seldom replay videos. When I showed Wendy how we could now access the HomeRun box from our iPads with its own app, she immediately asked if it had Adult Swim. She had reveled in the nighttime content on the Cartoon Network channel years back when she had cable TV. While I could subscribe to that and other “premium” content via the HomeRun service, we would have to rely on using my Windows 10 desktop or some other hardware in the home for a DVR. I decided to explore our options. I found I could go back to a TV/internet bundle with our cable company, which would provide apps to watch its shows on our mobile devices. But there was no true DVR capability included, and I knew Wendy would want the ability to record shows and skip through the commercials. Internet streaming options included Hulu and Sling TV. I decided to try Sling TV free for a week, opting for its Blue package with the Hollywood Extra to pick up Turner Classic Movies, plus its Cloud DVR option. That would give us access to all of the channels we had some level of interest in with the ability to record 50 hours of shows and skip their commercials on playback, except for required ads in some Fox shows, including some on its National Geographic channels. That bundle would cost $35/month with the benefit of a cloud-based DVR so we wouldn’t be eating up as much of our own bandwidth nor using the office desktop to store shows. The Sling TV apps on our iPads and the desktop are easy to navigate, with a nice viewing grid which includes good synopses of the various shows. There are also on-demand episodes of some shows, but those won’t let you skip their commercials. So Wendy will try having Sling TV record episodes of various shows for later playback. We celebrated the return of subscription television by watching an episode of Chip and Joanna Gaines’ Fixer Upper show on HGTV on our big television, and I figure in the coming weeks I’ll hear Wendy giggling at some comedy shows she has recorded. A decade after they left, the channels of cable television are again available in the Manor, although in a different manner, and we can enjoy easy access to over-the-air broadcasts on our mobile devices. However, my prediction is that I’ll use the HD HomeRun Connect Duo and the Sling TV services sparingly. I’m more drawn to tightly focused and rather nerdy podcasts and YouTube channels and reading books with my Kindle app. But it is nice to have more options, and I expect Wendy will get some real use out of Sling TV. This entry was posted in HDTV, home repair, technology. Bookmark the permalink.